As I mentioned before, I started saving for my children’s college education as early as I possibly could – in mid-2005 for my son and in mid-2007 for my daughter. In each case, I opened up a 529 plan with myself as a beneficiary as soon as we knew the child was coming, then I changed the beneficiary to the child as soon as the child arrived – this allowed me to start saving prenatally. Since my investing goal was a pretty long term one – college is at least fifteen years away for them, even now – I chose an aggressive portfolio for the investing – 90% stock index funds and 10% bonds. I then set up an automatic investment plan – $100 a month for each of them. Notice the start dates, though – mid-2005 and mid-2007. In each case, my investments for their college education caught the full force of the recent stock market downturn. I’d log on every month or two to check on the investments to find that the balance had gone down, even after the contributions. If it were simply an investment for my own retirement, I could internalize it with no problem. I can stomach losses for my own future, because I’m secure in my own knowledge that over the long run, the tendency of a diverse stock investment is to go up. But I would look at the terrible 529 investment return, look at the pictures of my kids on my desk, and I’d feel guilty. “I’m putting aside money for their future like I should be, but it’s falling through my fingers like sand. Their future is slipping away,” I would think to myself as I looked at the pictures, and I’d be sorely tempted to change that investment around to put the money into something more conservative. It is incredibly easy to let emotions get in the way of rational choices when you’re a parent. You see your children so full of happiness and love, yet still dependent on you for so much, and you want desperately to ensure that they’re safe and that a bright future awaits them. But emotional investing is the most dangerous kind of investing. When you invest with your emotions, you try to time the market. You sell late into panics and buy late into rallies. You often undo many of your earlier good choices. And, in the end, you’re left with much less than you would have had otherwise. Instead, if you’re investing for the long term, you’re far better off removing your emotions from the equation as much as you can. Set up an automatic investment plan, sit back, and wait. Make adjustments only because you’re moving closer to your target date, shifting to more conservative options as the big day arrives (or, even better, invest in a plan that does this automatically for you). Look at the balance if you’d like, but don’t let a few poor balances cause you to make radical changes. 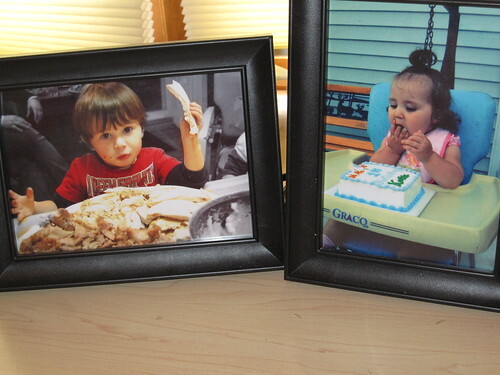 I look at those two pictures on that desk and I see two young children who rely on me to make many decisions and choices for them. I invest for them, of course, but I also do things like prepare their meals, help them get dressed, and regulate how much candy they can eat and how many DVDs they should watch. As much as I love them and want to maximize their safety, sometimes the best choice isn’t the one that my heart yearns to make.